Who doesn't love a beagle’s doe-like eyes and happy, easy-going nature? Their cute, floppy ears? As a member of the hound family, they live to use their nose and love to eat! They are excellent as scent detection dogs at airports and can search out weapons, drugs, and illegal food items with ease. 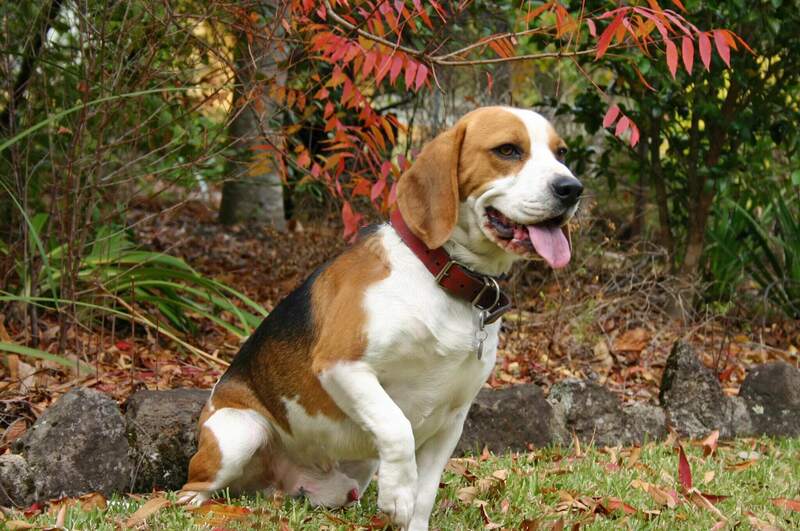 Originally bred in England to hunt, the beagle has long been popular as a family companion. Beagles have been around so long that no one is quite certain of their origins. Similar size and type dogs were found in Ancient Greece in the 5th century BC. To hunt rabbit and hare. Early Beagles during Medieval times were small and stood only 8 to 9 inches tall. They were called "pocket Beagles" because they were small enough to fit into a hunter's pocket. As larger dogs were needed for hunting larger prey, these smaller Beagles became extinct in 1901. The more modern breed which is larger in size originated in Great Britain in the 1830s as a cross between two breeds: the Southern Hound, and the North Country Beagle. A man named Reverend Phillip Honeywood of Great Britain started a breeding program and King Henry VII and Queen Elizabeth I fell in love with the breed. Wanting to improve on the breed, Thomas Johnson produced dogs that were more stately in appearance and better hunters. General Richard Rowett from Illinois, USA imported some Beagles from England and began breeding what is known as the standard Beagle today. The Beagle was accepted as a breed by the American Kennel Club (AKC) in 1884. Now the breed is as noteworthy as a family companion as it is as a hunting dog. When training your Beagle, always have him on a leash or he will follow his nose versus your commands and head off in search of an enticing scent. 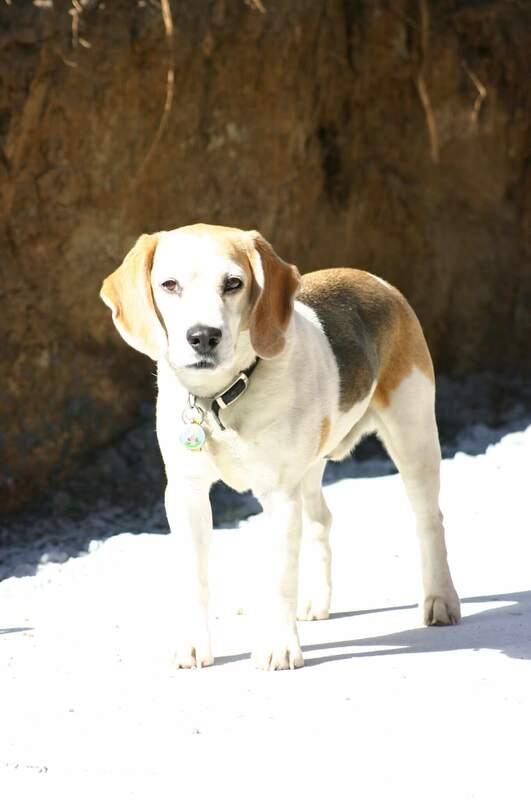 As Bark Busters trainers, we have seen Beagles plow through drywall when left alone for too long. To cut down on the destruction, Beagles need a lot of exercise, education and an outlet for their energy. 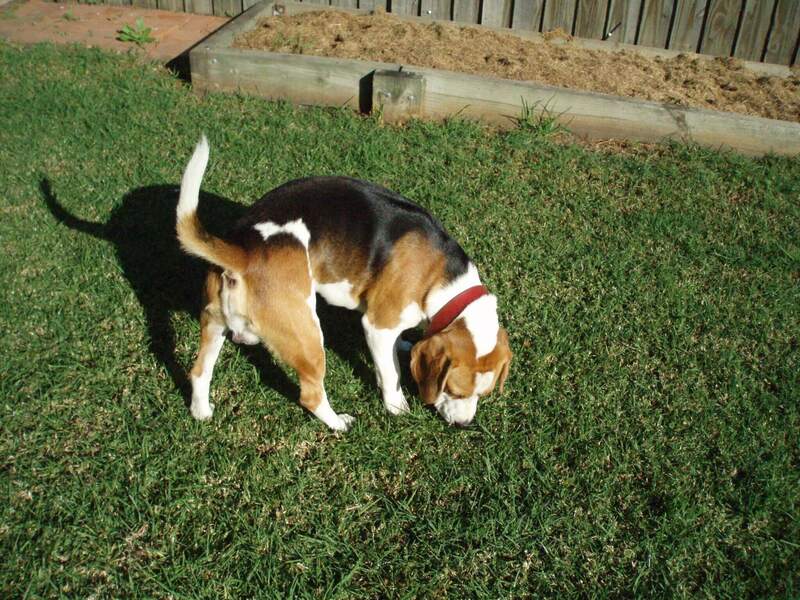 Beagles are scent hounds and are wonderful escape artists so a fenced in yard or a leash on a walk is essential. Most don’t like to swim. Not great as guard dogs-they are generally everyone’s best friend. The "Beagle Brigade" patrols the baggage-claim areas at more than 20 international airports and other points of entry into the United States. They are used for this purpose because of their appeal and the fact that most passengers don’t fear this breed. The “Peanuts” character Snoopy was a Beagle and possibly was the reason behind some of its popularity. Although we know Queen Elizabeth II as a huge Corgi fan, the first Queen Elizabeth loved the miniature “pocket” Beagles. Barry Manilow owned a Beagle named Bagel and featured them on his album covers. Beagles are often described as: “they never met a person they didn’t like”. They get along well with kids and other breeds because they are carefree and cooperative. In fact, the Beagle has a fun and curious nature, much like many children. They can thrive both in the city and country, although they do best with plenty of room to roam. If you are looking for a couch potato – this is not the breed to choose as they require a lot of exercise. The two biggest dog training problems with the Beagle involves coming when called and walking by their pet parent’s side on a leash. Why? Because Beagles have their nose to the ground and prefer to follow that versus you! They will wander around whether supervised or not. It is believed the name “Beagle” comes from the Middle French words “bee gueule,” which literally translated means “wide throat,’ or more commonly for the Beagle loudmouth. The breed is multi-talented and is often used by U.S. Customs to search for illegal food, plants and drugs because of their phenomenal sense of scent. It’s not uncommon to see beagles in airports, sniffing around the baggage lines. However, the Beagle doesn’t have to hunt to be happy – he can he just as happy on the lap of a loving dog owner. “There are two Beagle varieties: those standing under 13 inches at the shoulder, and those between 13 and 15 inches. Both varieties are sturdy, solid, and “big for their inches,” as dog folks say. They come in such pleasing colors as lemon, red and white, and tricolor. The Beagle’s fortune is in his adorable face, with its big brown or hazel eyes set off by long, houndy ears set low on a broad head. A breed described as “merry” by its fanciers, Beagles are loving and lovable, happy, and companionable—all qualities that make them excellent family dogs. No wonder that for years the Beagle has been the most popular hound dog among American pet owners. These are curious, clever, and energetic hounds who require plenty of playtime. Beagles…what can you say that hasn’t been said a thousand times before? A small hound with a big personality. Adorable puppies with the funniest howl. Cute as a button with a nose powerful enough to track a thief or to smell mom cooking dinner from 50 yards away. Long floppy ears that look like Superman’s cape when they are in full sprint. Great hunters but they can double as a lap dog at the end of a full day of running. However, just like any breed, they present unique challenges. They are known for being stubborn and can give you a “run for your money” when trying to train them. 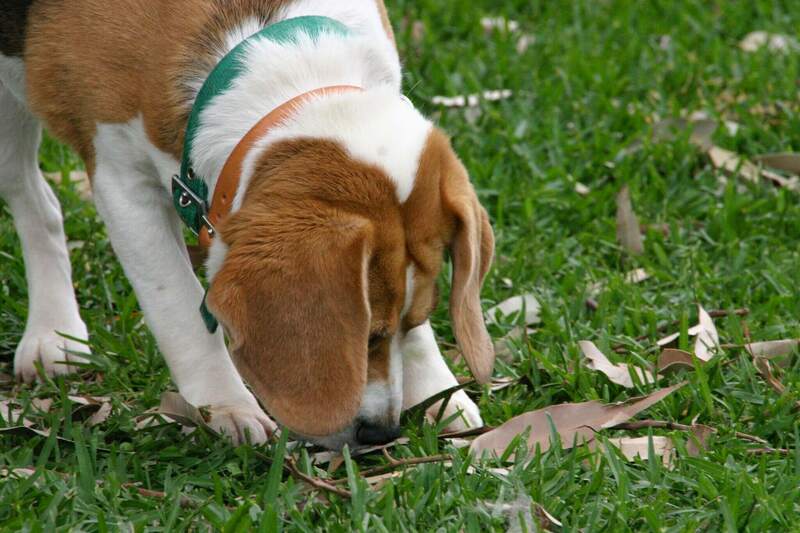 Beagles tend to walk with their nose to the ground looking for the next bug or chicken bone. So it is challenging, but doable, to teach them to walk at your side. They can be prone to becoming anxious when left alone so, as puppies, they definitely need to be confined or crated or you may come home to find holes in your walls. Their “chase first, ask questions later” has caused more than a few beagles to run through screen doors or to run into glass doors that they forgot were there. Read more about Robert Machi on his website. 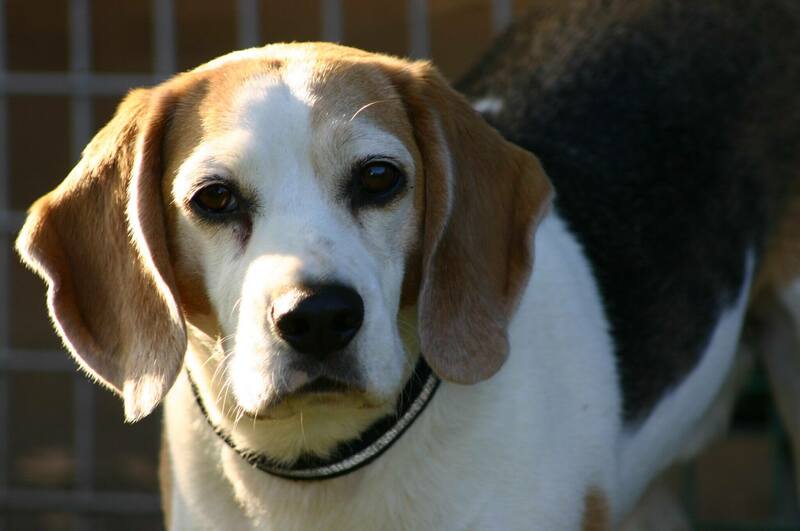 Your Beagle&rsquo's health concerns will change over the course of their life. A puppy might be more prone to an upset stomach or eating something they shouldn’t, a 2-year-old Beagle is more likely to rupture a disc in their back, and a senior Beagle may contract pneumonia or develop a cancerous mass as they age. Beagles also have personality and physical traits that may make them more prone to certain conditions—they’re prone to allergies, and due to the length of their bodies, they are susceptible to back issues and lameness as they get older. As a pet owner, you should expect to pay for basic veterinary care like vaccines, spay/neuter, and annual checkups. Many pet owners don’t consider the unexpected illnesses and injuries that can occur throughout a pet’s life, and they don't prepare for them. Medical insurance can help a pet owner prepare. The concept of medical insurance for pets is fairly straightforward—pay a monthly premium to be covered for eligible veterinary expenses. But every provider is different, offering varied coverage with different plans, pricing options and limitations. As you research, pay close attention to coverage, deductible options, and ease of use. To get started, learn more about insurance for your Beagle at Trupanion.com. I can’t tell you how many Beagles named “Snoopy” I’ve worked with but it’s been a lot! Even I had a “Snoopy” when I was a child. Beagles, typically, are great family dogs who are tolerant of kids, although as with any dog living in a home with children, clear rules and boundaries for both need to be established and maintained. Beagles are scent hounds which means that even more than some other breeds they are ruled by their noses. They will naturally follow a scent until they either find the source or they find a more interesting scent. Due their prodigious ability to follow a scent they make excellent hunters and trackers. Tracking is an activity they were born to excel doing. Following their noses however can make them challenging to walk. Recall, or coming when called, can also be a challenge for Beagles. These are probably the two areas of behaviors that Bark Busters Trainers deal with consistently with Beagles. If there’s a game a Beagle will really enjoy it’s “find the treat”. It’s a simple game to teach. You get a treat and let Snoopy smell it. Put it close by in plain sight and say “Find the treat”. Since it’s close by and in sight he'll find it very quickly. Make a BIG DEAL of him “finding it”. WHAT A GOOD BOY ! GOOD FIND! The more excited you are about it the better. You repeat it and each time make it just a little more challenging. Keep making a big deal when he finds it and it won’t be long before he'll understand “Find”After “snoopy” knows the game you will be able to hide a treat almost anywhere and he'll find it. It can be very entertaining watching a Beagle search for the hidden treat. You can also use other items, toys, or something of yours. You can even play hide and seek with family members. Kids love playing that game as will Snoopy. With patience, consistency and speaking dog you will be able to walk Snoopy with his head up instead of nose to the ground, and he will come when you call him. Our trainers are experts at helping you with these and any other behaviors issues your Snoopy might have. 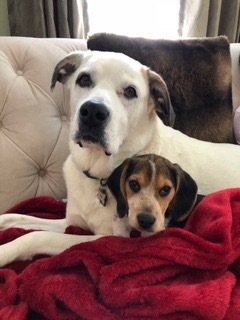 When you learn to “Speak Dog” and teach your Snoopy how to fit into your life using methods he already understands the results are Happy Dogs and Happy Families. Remember that dogs learn how to communicate with each other when they are first born and their Mamas are dealing with the litter. Their Mom doesn’t use food or pain to get them to do what she wants them to do. Instead, she uses guttural sounds, and body language. 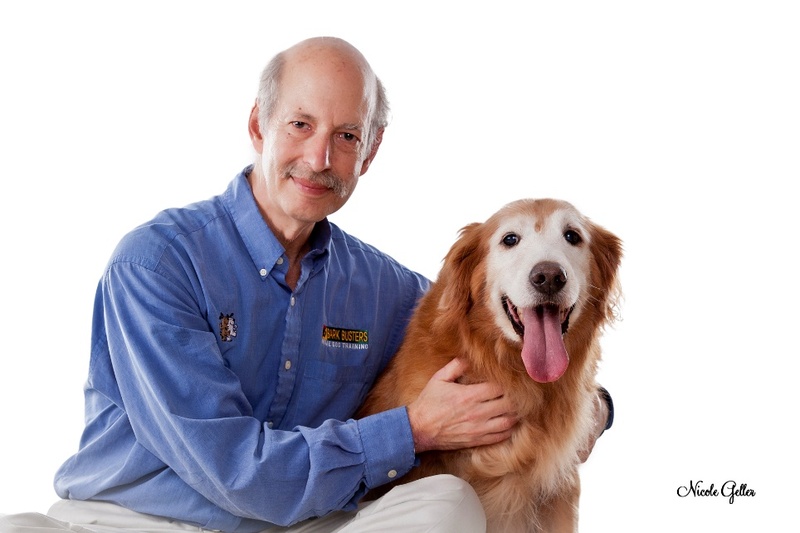 Bark Busters will teach you to communicate with your dog – the way dogs naturally communicate. Every move you make your dog is judging your tone of voice, your facial expressions, your posture, and how you are interacting with him to see whether you are worthy of his trust and respect. He may decide that he loves you but he doesn't respect you and therefore won’t obey or listen to you. Contact your local Bark Busters trainer at www.barkbusters.com for more info on dealing with and understanding your Beagle. The best type of safe socialization for your Beagle is to socialize with dog owners whose dog is well behaved. You do not want your new dog to be intimidated by a bigger dog that can seem like a bully. Nor do you want your new dog to pick up and bad habits. Since Beagles normally get along with others dogs, adding a Beagle to your pack shouldn’t be a problem. However, you will want to read these tips about multi-dog households. It might be best to avoid dog parks for awhile as this can be pretty overwhelming, particularly for a puppy. It’s best to start by introducing your dog to one or two new dogs. Be sure to have your Beagle on a leash so no scuffles ensue. Many new puppy parents cannot wait to take their new puppy out in public or straight to the dog park This is where some of the seeds of mis-behaviors issues are sown. Unfortunately, Bark Busters trainers see many dogs who developed a fear early on in life as a result of another dog. 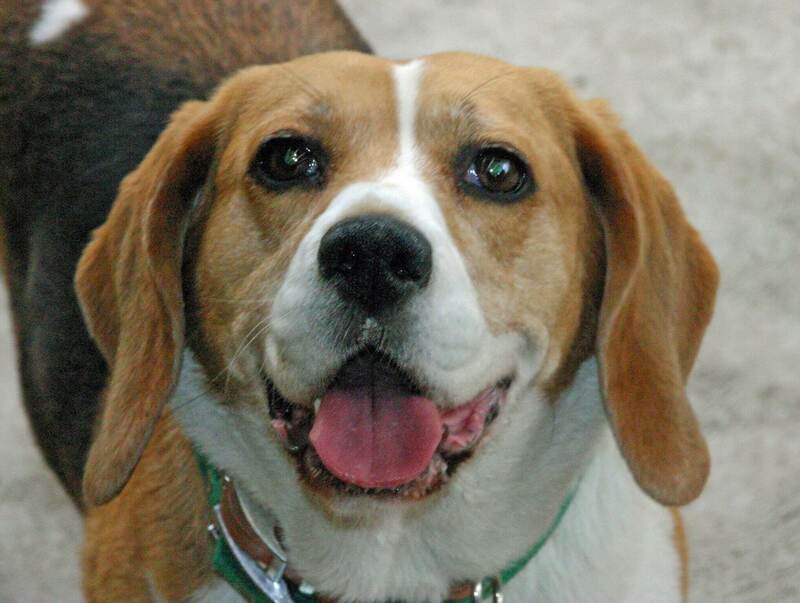 Take Bella who was a new Beagle puppy who developed a fear of men that she learned from the next-door neighbor’s dog. This took some re-programming on the part of the Bark Busters trainer so that Bella could develop a healthy relationship with other dogs, she encountered. Select those dogs as playmates for your Beagle puppy, that are ‘low energy, tolerant dogs’. Dog Parks are one of the most misunderstood activities of the modern-day-dog world. Some Doggie parents love nothing more then to take their dog to a ‘dog park’. They have been told they need to socialize their dog and so off they go. That is the upside, the downside is, there are those dog lovers whose dogs don’t fit into this world at all. They are those dogs or puppies that were bullied, frightened on their first visit or whose personality does not fit the mold. These folks agonize over the fact that their dog or puppy does not look forward to its trip there, it hides under the seat of the car or it has to be carried or enticed into the park. 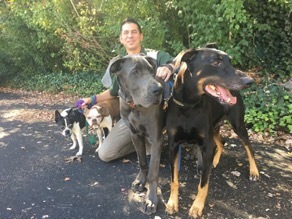 Bark Busters do have ways to assist these pet parents, but we do also explain why their dog might the Dog Park because of its personality. It reminds us of a friend of ours who visited us regularly with her little dog “Harry”. When they would arrive, Harry would walk up to each of us, sniff our legs and walk away. We told her that ‘Harry’ was not a social dog and preferred not to be touched by anyone other than her and he avoided any interaction with our dogs also. He was a ‘one person’ dog that did not feel comfortable around others. It was like a light had been turned on, our friend smiled and told us that this explained a lot to her. She further explained that every time she took ‘Harry’ to the Dog Park, that he could not wait to get back to the car when it was time to leave, that he would stand away from the other dogs, never join in the play and snap at other dogs when they came near him. There are many Beagle-Specific Rescues, animal welfare shelters, Humane Society, SPCA and RSPCA’s who have many great dogs looking for homes. Understand there is no such thing as a bad dog. Dogs are abandoned because many dog owners don’t have the time or right training to get their dog to behave. Bark Busters can help with this. These organizations test their dogs for temperament and soundness. By adopting, you will be helping a dog in need, one that wants nothing more than to be in a loving home. You will be helping the pet overpopulation issue and save a deserving dog from being euthanized. The idea that dogs who are sent to shelter have too much baggage is a myth. Shelter dogs have no more issues than dogs adopted from a reputable breeder. Your dog’s behavior will depend on YOU establishing yourself as the “leader of the pack”. Animal Welfare and Rescues do amazing work in trying to save dogs and match breeds to the right owners, so consider that option when looking for a new puppy. Check its hearing and vision by clapping behind its head and rolling a ball … does the puppy watch the ball’s direction? Do not bring a puppy home before it has reached 8 weeks of age. It is important they have bonding time with their her Mother and litter mates. Initially keep your puppy on the same diet. If you want to change food, do so gradually. Puppies chew. Remove any dangerous chords or chemicals. Food. This breed is in the “working-class” and therefore needs a good quality protein-based food—real meat versus byproducts or meals— with added carbohydrates (such as brown rice) for energy. If you want your Beagle to live a long and healthy life, talk to your veterinarian about feeding your Beagle a raw diet. Because Beagles love food, they are prone to being overweight, so you have to carefully watch their calorie consumption and weight. Shelter. Beagles are social animals so having them as an “outdoor” dog might be a mistake. Instead, have a crate or special bed where they can go and feel safe. Any breed of dog can feel overwhelmed, so it is important then have their own “den” or bed away from the action. Having them sleep with you or in a doggie bed is up to you. If they are going to spend any amount of time outdoors make sure to have a fence or they will be off and roaming around in no time! Security Although Beagles are very independent, they still need you to make them feel safe, like their Mom did when they were first born and part of the pack. They must respect you and know that you are the pack leader. Don’t look to a Beagle to “sound the alarm” as they are not great guard dogs – they will lick the burglar to death! Entertainment. A tired dog is a well-behaved dog. Your Beagle needs daily exercise, interaction with you and some interesting activities to do or he WILL get into mischief. If you leave him alone for 8 hours, he will cause trouble. Dogs vent their boredom by being destructive … chewing, digging, barking and more. A hearty game of fetch daily and a long walk will go a long ways toward keeping your Beagle healthy and physically and mentally stimulated. See the GameChanger® in action! It is made from Flexa-Pure - a soft but sturdy, durable non-toxic PBA-free polyurethane material. If your dog totes it around your hardwood floors, it’s even quiet! 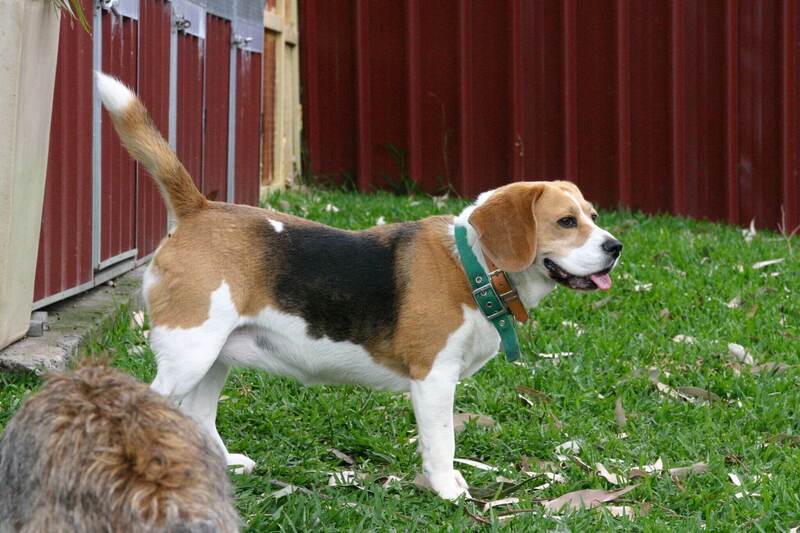 Beagles are prone to wandering off so it’s more important than ever to have an updated pet identification tag. That’s where the WaggTagg™ comes in – a pet identification tag that makes it easy to find your dog should he/she get lost. 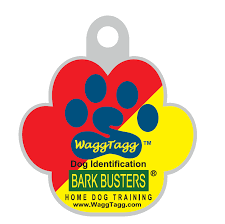 This pet identification tag is free to all Bark Busters clients and this brightly coloured tag cannot be missed by the finder. The finder simply needs to scan the tag, which sends a text message directly to the dog owner and several other people that have been specified by you. For instance, you could put a family member as your contact, your vet, or your neighbor in case you are away. First, the WaggTagg™ works via a unique QR code and is free to all Bark Busters clients. The tag has not subject to any renewal or ongoing fees. Once your dog is registered in the WaggTagg™ data base, you can easily update your information if it changes at any time. No “chip” reader necessary! As a backup system, Bark Busters recommends you get your dog microchipped. The problem with a microchip, according to many vets we spoke to is that all microchip scanners are not compatible. Therefore, your vet may have one type and another vet down the street a different kind. Also, many vet clinics have limited hours … what if your dog wanders away in the evening or on a weekend. We want you to be reunited with your dog as soon as possible! 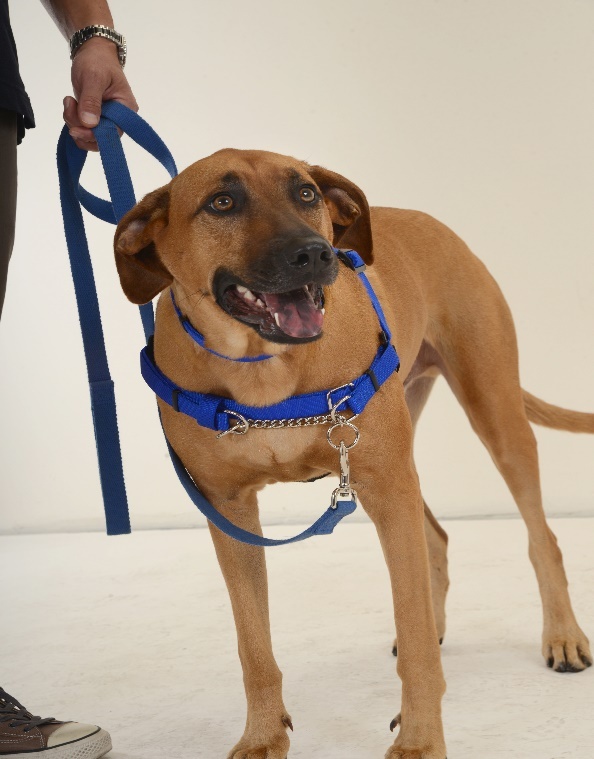 This harness is unique in the world of walking aids for dog in the fact that it uses sound to educate your dog where it should walk and not to pull.